By Stephanie Davies "The Urban Worm Girl"
Composting inside and out? The title grabbed me right away. Not everyone has a sunny spot in the back of the garden for the classic three bin composting system; that perfect place away from the house to toss the weeds from garden, the grass after lawn mowing, yesterday’s newspaper, and kitchen scraps. If you have been freezing and canning in preparation for the coming winter, you have lots of kitchen scraps. In Composting Inside and Out, Stephanie Davies starts with a thorough overview of the composting process and the need for everyone to do their part in reducing the amount of trash we send to landfills. Did you know that the average American disposes of close to 4.5 pounds (2kg) of garbage each day? We could easily use a large part of this garbage in our own gardens, eliminating a major portion of our landfills. A win-win for ourselves and great environmental stewardship. Chapters 2, 3, and 4 are all about our soil, how to easily begin composting and the beneficial bacterial and fungal friends who decompose our ‘wastes’ and create something quite special. There is detailed information on the important Carbon-Nitrogen ratio (brown-green), and how to achieve the ideal balance. The author even gives advice on how to control smells and flies if they become a problem. 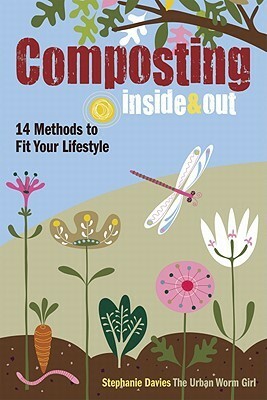 Davies describes 14 different composting methods with detailed step-by-step instructions for inside and outside. She gives great advice on finding the right equipment, from building your own to purchasing equipment that will actually work for you. For outdoor composting, Davies describes the one, two, and three bin methods, tumblers, stationary closed bins, hot and cold composters, digesters, piles or heaps, trenches, and lasagna or sheet method. She even addresses how to use a composting toilet. For indoor composting (this is what I wanted to learn), she discusses compost bins that work in your garage (with an electrical outlet), anaerobic decomposition through fermentation, and vermiculture with worm bins (including a detailed menu for the worms). Because Davies calls herself the Urban Worm Girl, there is an entire chapter on worms and our soil, and another on getting started with worms. Everything you have ever wanted to know about vermiculture is here. After reading this wonderful reference book, there really isn’t any excuse not to make your own compost. This is putting your own waste to good use. This is reclaiming the benefits of participation in our planet’s health and future well-being. Composting…simply miraculous!